carpet events, award shows and even holiday gatherings. The key to achieving this stained-glass effect lies underneath the polish: in a crystal clear tip. We’ve teamed up with nail experts to create a flawless base for jelly nails using two new and on-trend methods for clear extensions. Apply a form by aligning the centerline with each finger’s bone. Start with a generous amount of clear builder gel on your brush. Float the product starting on the bottom third of the nail, moving from sidewall to sidewall to create the free edge. Flash cure. 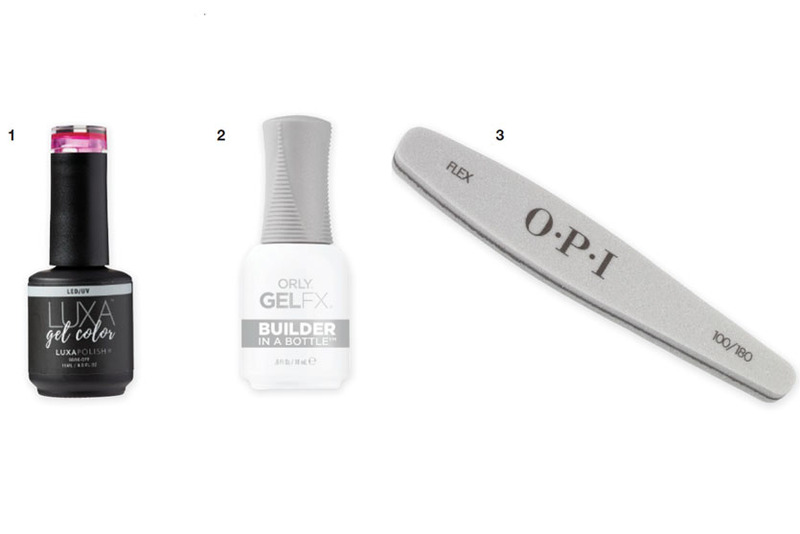 Remove the form and apply a layer of clear builder gel to the body of the nail. Don’t cure. Build the nail structure, reinforce the sidewalls and then cure. Gently file the nail to refine the shape. Then, apply a layer of gel top coat over and underneath the nail and cure for a crystal clear finished look. File the nail short to avoid seeing any natural nail free edge through the clear extension. Lightly buff and cleanse the nail, and then apply primer and bonder to the nail, careful to avoid the skin. 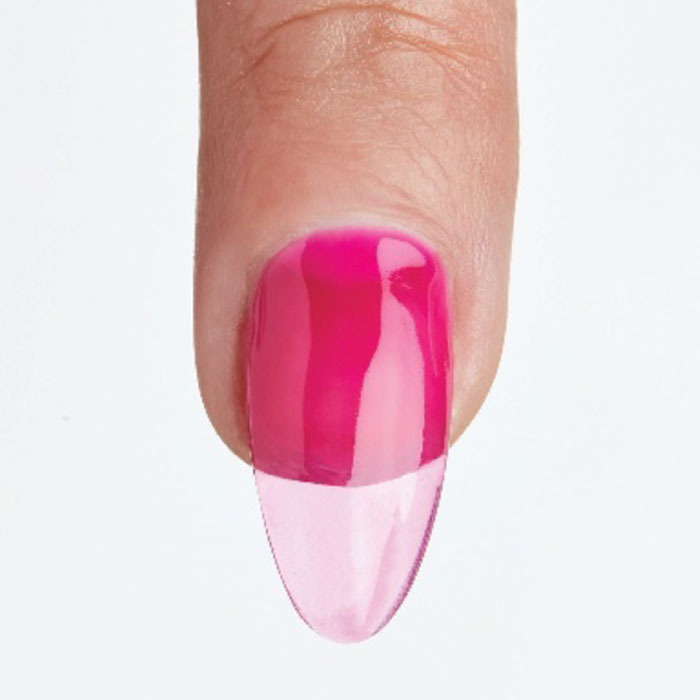 Apply a thin layer of clear gel to the natural nail. Cure. Use a sanding band or cuticle bit with an e-file to file the underside of the tip one-third of the way up. With a fl at brush, pick up clear gel and apply it to the filed underside of the tip. Apply the nail at a 45-degree angle starting at the cuticle area. Push forward until the gel fills up to the natural nail. Press firmly on the nail and flash cure. Once all five tips are applied, cure. Trim the nails to any length and file to the desired shape. 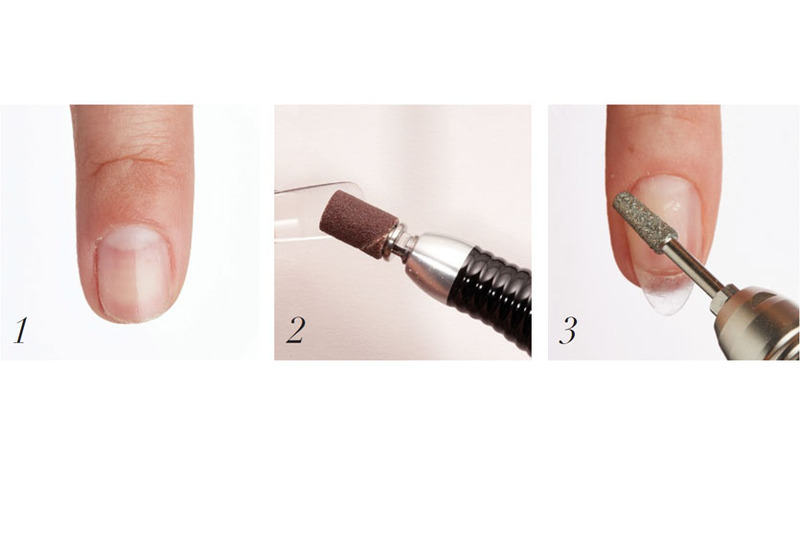 Use a cuticle bit to file around the cuticle area for a seamless edge. Wipe off the nail with acetone. Apply jelly color directly to the nails—no base coat necessary. 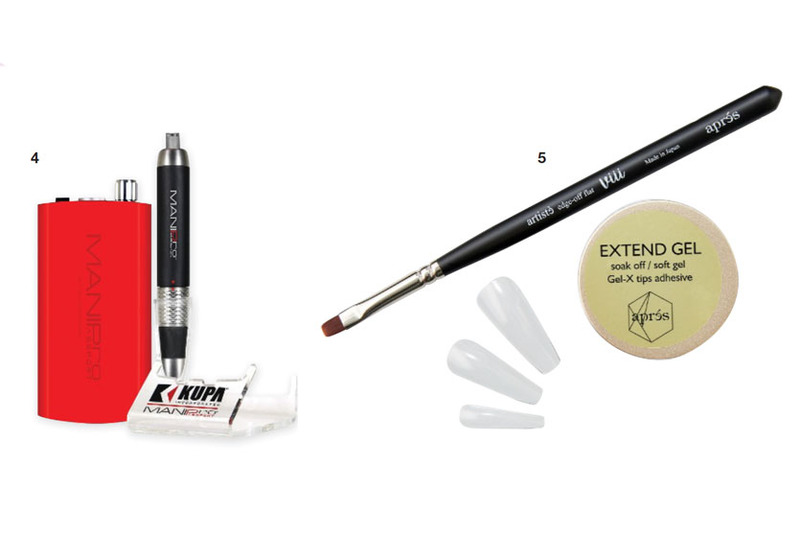 Recreate the Look With These Must-have-Products!